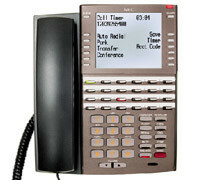 34-Button Backlit Super Display Telephone with Full-Duplex Speakerphone The Super Display Telephone is the system’s most sophisticated telephone instrument. It features a large 9 line-by-24 character backlit alphanumeric display with 12 Interactive Soft Keys for intuitive feature access. It also provides 10 Personal Speed Dial bin keys, 24 programmable Feature Keys and 12 fixed function keys for streamlined operation. Additionally, this telephone offers a built-in full duplex speakerphone (with no external speaker or microphone required), a backlit keypad, and a headset jack. Unique features include dual LEDs, a Ring/Message Lamp (to show ringing, Caller ID, and voice mail messages), built-in wall mounting, and an innovative two position angle adjustment.